..... Click the link for more information. , the electric motor, and the internal-combustion engine, including the diesel engine. They are still sufficiently economical to be used in industries where steam is necessary for some purpose in addition to that of driving an engine. a prime piston engine for converting the potential heat energy (pressure) in steam to mechanical energy. The operation of a steam engine is based on periodic changes in vapor pressure within the cylinder. The volume of the cylinder varies as the piston moves back and forth. 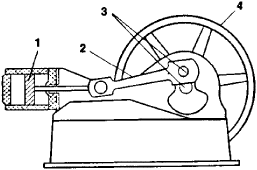 Steam enters the cylinder of the steam engine, expands, and displaces the piston; a crank gear transforms the reciprocating motion of the piston into the rotary motion of the shaft (see Figure 1). The admission and release of steam is accomplished by the steam-distribution system. The cylinders of a steam engine have steam jackets to reduce thermal losses. The first steam engine to have practical value as a general-purpose power source was designed by J. Watt between 1774 and 1784. Pioneers of the steam engine included D. Papin, who invented the steam boiler in 1680; T. Newcomen, who invented the atmospheric steam engine for raising water in 1705; I. I. Polzunov, who designed a steam blower between 1763 and 1765. The steam engine was the first—and, until the late 19th century, practically the only—general-purpose engine and played a singular role in the progress of industry and transportation. In time, stationary steam engines were developed for use in factories and electric power plants. Locomotive steam engines were developed for railroad use, and marine steam engines were designed for merchant ships and military vessels. Mobile steam power units came to be used in agriculture and local industry. Steam engines achieved a high degree of reliability and sophistication as early as the second half of the 19th century. Beginning with the 20th century, however, they met with increasing competition from rapidly evolving steam turbines and internal-combustion engines. The drawbacks of steam engines include low efficiency (from 1 to 20 percent), limited speed (up to 1,000 rpm), and total power output (up to 30,000 hp), size, and weight. As a result, the production of steam engines ended in the mid-20th century. Steam engines are found today (1975) only in steam locomotives, in steam power units, and on old steamships. Grinevetskii, V. I. Parovye mashiny, 2nd ed. Moscow, 1926. Obshchaia teplotekhnika, 2nd ed. Moscow-Leningrad, 1952. Zhiritskii, G. S. Parovye machiny, 6th ed. Moscow-Leningrad, 1951. A thermodynamic device for the conversion of heat in steam into work, generally in the form of a positive displacement, piston and cylinder mechanism. The 20th century saw the practical end of the steam engine. The steam turbine replaced the steam engine as the major prime mover for electric generating stations. The internal combustion engine, especially the high-speed automotive types which burn volatile (gasoline) or nonvolatile (diesel) liquid fuel, has completely displaced the steam locomotive with the diesel locomotive and marine steam engines with the motorship and motorboat. Because of the steam engine's weight and speed limitations, it was also excluded from the aviation field. See Diesel engine, Gas turbine, Internal combustion engine, Steam turbine. A typical steam reciprocating engine consists of a cylinder fitted with a piston (Fig. 1). A connecting rod and crankshaft convert the piston's to-and-fro motion into rotary motion. A flywheel tends to maintain a constant-output angular velocity in the presence of the cyclically changing steam pressure on the piston face. A D slide valve admits high-pressure steam to the cylinder and allows the spent steam to escape (Fig. 2). The power developed by the engine depends upon the pressure and quantity of steam admitted per unit time to the cylinder. Engines are classified as single- or double-acting, and as horizontal (Fig. 1) or vertical depending on the direction of piston motion. If the steam does not fully expand in one cylinder, it can be exhausted into a second, larger cylinder to expand further and give up a greater part of its initial energy. Thus, an engine can be compounded for double or triple expansion. Steam engines can also be classed by functions, and are built to optimize the characteristics most desired in each application. Stationary engines drive electric generators, in which constant speed is important, or pumps and compressors, in which constant torque is important. Today, both the waterwheel and steam engine are run on visitor open days. iconic The steam engine makes its way over Glenfinnan Viaduct. For the next 11 years Boulton's factory produced steam engines and sold James Watt them to colliery owners who used them to pump water from their mines. However, he took Watt's low-power steam engine and created the high-power steam engine in 1805 (PBS, 2010). James Watt used this model to develop the separate condenser, the greatest single improvement to the steam engine ever made. However, with the industrial revolution and the invention of the steam engine came a more refined and less hit-or-miss approach to solving problems--and with less explosive results. The model of a single-cylinder vertical stationary steam engine was one-inch high and formed part of a collection made by the late John Robson, a Gateshead fitter. He includes a special chapter on how a steam engine works, but in fact his text, diagrams, and photographs explain the workings throughout. The pair's 18th century Birmingham business partnership led to developments in the steam engine which helped drive the industrial revolution. Neralo (Maharashtra), May 25 (ANI): The adorable toot of the steam engine brings back the nostalgic memory of the times when steam engines were used for commuting purpose. A year later he acquired a four-horsepower vertical fire-tube boiler, manufactured in 1940 by the Lookout Boiler and Manufacturing Company, and set it up outside his shop next to the steam engine.